I neglected to mention regarding the acceleration videos the concept of "jerk". Basically, it refers to the rate of change of acceleration. That is to say, we often just default to concepts of constant acceleration for ease, but in reality acceleration itself usually changes over time. So, for instance, if you're riding in a car and the driver hits the gas pedal, no matter how quickly he does so a number of things prevent the vehicle from instantly assuming its maximum acceleration. The travel of the pedal, the response of the computer in regards to fuel injection (or simply the opening of the doodads related to the carb), the time it takes the engine to rev up, that power going to the transmission which has its own things to do, et cetera. Long story short, the tires simply don't instantly start spinning at maximum (and even if they did you'd probably just get squealing tires anyway unless and until some friction could be restored to the mix). The experience in the seat, then, is going to involve an increase of acceleration over time. The same thing happens in non-automotive contexts, as well. Shuttle solid rocket boosters were throttle-able, but even so they didn't achieve the intended acceleration at particular throttle settings immediately. I see no real reason to assume the same wouldn't be true of science fiction vessels . . . though if a sci-fi vehicle can achieve 1000g acceleration (for example), one would presume it wouldn't take very long at all to get to, say, 20g. The videos made thus far do have jerk only inasmuch as SketchUp forces the matter, but generally speaking are not intended to have any jerk (or for all jerk to happen instantly on start, if you prefer to think of it that way). The goal is to show the result of constant acceleration assuming that maximum acceleration can be achieved instantaneously from a standing start. First, here's an alternate version of the 20g video from the last post . . . this one has the framerate dropped a bit and some other tweaks that make the overall motion feel a little smoother. With that out of the way, let's now check out the ships zipping off at 1000g. Download the 1000g acceleration video here. The same caveats apply insofar as positional accuracy only being true at interval seconds. However, one clearly gets the sense, even at 640 by 480, that any small ship is just gone like a bat out of hell. With the first frame of motion at 10fps, the Y-wing and TIE are barely-discernible smudges. Even the Enterprise-D is virtually nothing after two or three seconds of motion. At the tenth second, the vessel would be moving at 100000 m/s, or 100 kilometers per second. Per Celestia, planets would visibly grow or shrink (albeit slowly) at that velocity when within 20 or 30 thousand kilometers. I mentioned in a recent post that I'd been wanting to do acceleration demo videos. This is a rough cut, a demo of a demo . . . I really need to use something other than SketchUp for this. What I did was to position a variety of vessels in front of the camera, all of which (save for the Y-wing which I messed up somehow) with their tails touching the origin line perpendicular to my camera view, and above the "surface". Incidentally, the Twilight and Bird of Prey are not touching. I then placed the camera six meters up on a proverbial pole and at a nice distance away from the origin point, about fifty meters back, so that it was possible to see some of the ships in the first frame. I suppose I could've had the camera touching a ship but that would basically never happen in a show anyway, so it made sense. I then made marks and camera poles at the distances where, if the *camera* was accelerating away at 20g or so (which, for ease, is based on a g figure of 10m/s^2 instead of 9.8), the camera would be located at integer seconds. In other words, assuming a start of zero velocity, I marked the spot where the camera would be at 1 second, 2 seconds, 3 seconds, et cetera, from the camera's start point. Now, bear in mind, this is effectively a stop-motion video of one-second increments. I say that because the way SketchUp scenes work, the vessels have no velocity at each scene "frame", and so they basically stop at that point. 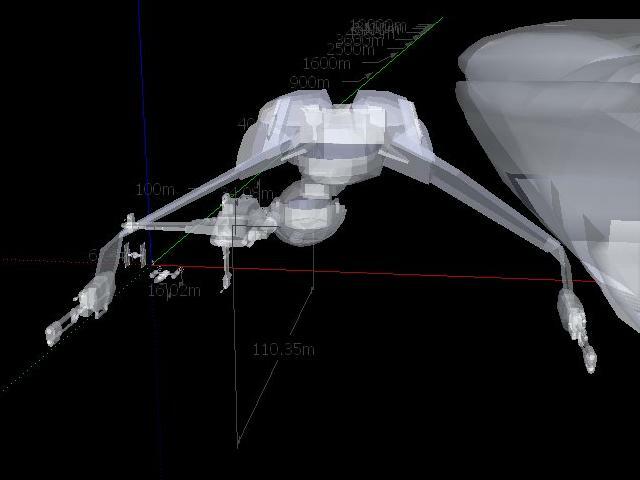 And, there is little control of how the ships move in-between frames, so the normal Sketchup technique of ramping up speed then slowing down to stop at the next "frame" is used. As a result, the ships appear to rush to the next point, stop, rush to the next one, stop, et cetera. The best I could do was make the stop as short as possible, zero seconds, but the herky-jerky motion still occurs (over and above any jerkiness from the display of too many models). There may yet be some additional smoothing I can do, but for now this is it. 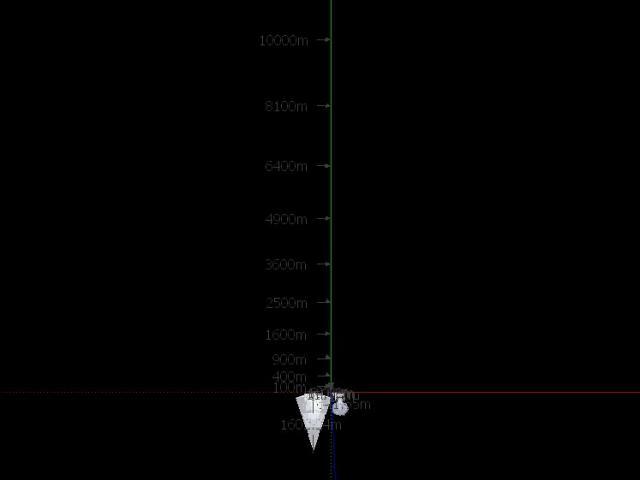 However, in aggregate, and at one-second intervals, this is positionally accurate, so if you watch the video you will get a very rough approximation of what a ship zipping away at 20g or so should look like. Since I know now how to do this I may make SketchUp versions for other accelerations until I can get my hands on and learn to use better software for actual motion purposes. Or, for a better version, right-click here to download the file. I've been wanting to do some example-style work, and had motive and opportunity to do my first one. The below is from Celestia and shows the result of an approach (and withdrawal and approach and ... ) at three quarters of the speed of light, or around 225,000 kilometers per second. I used to play around with this sort of thing and it's become bleedingly obvious of late that other people haven't, and thus have no idea what this sort of thing should look like. A few caveats . . . this video was made in a small window, so Celestia automatically adjusts the field of view accordingly. So, it's only "really" valid at about 600 by 400. But, it gets the general point across anyway. One of my next demo videos, hopefully, is to show what ships actually look like when accelerating at 1g, 10g, 20g, 100g, 1000g, et cetera. There are a lot of people who don't have a clue what that would look like, either. I was thinking recently that I never really dealt with Star Wars shields because they're so many, varied, and odd. It's been my assumption that various shields act differently, which is not a bad thing really. -0. TPM TradeFed Landing Bay shield - invisible, generator unknown, does not block ships but does apparently contain air. -2. Droideka shields - not linkable (they always stay out of one another's way), blue bubble, blocks its own types of bolts inbound, and apparently outbound too given that it pokes its guns out. Can be penetrated by matter both ways (in the Blue Shadow Virus eps, Ahsoka hops on one and kills it by poking her deactivated lightsaber through it). 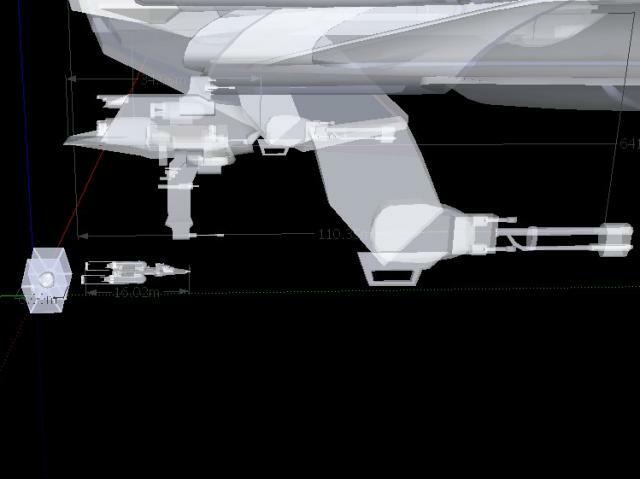 Starts small then gets bigger right through the hull of the droideka. -3. Naboo fighter shields - almost skintight, brief distortion on activation then not visible, reflected blaster fire, may or may not have allowed matter through in the form of a run-down droid (it's hard to tell), no other discernible effect. Flashed on in place and at correct size. -4. TPM Naboo reactor whatever shields - planar, red distortion visible, stopped lightsabers and presumably matter. Odd projector mechanism. -5. Invisible Hand landing bay shield - planar, blue distortion visible. Stopped airflow, no other known effect. -6. Invisible Hand "ray shield" - complex-shaped, white distortion visible. Lethal, stopped matter (presumably), lightsabers, and possibly even Force. -7. Separatist Battlesphere Reactor Room security shield - planar, red distortion, very similar to Naboo reactor shield. Described as "ray shield". -10. Death Star landing bay magnetic field - planar?, invisible, allowed matter passage but not airflow. -12. Death Star exhaust port shield - If it even could've been visible (e.g. we don't know where it is exactly), it was not visible. Allowed passage of matter but not turbolaser/blaster fire. -13. Hoth theater shield - invisible, unknown shape, unknown visibility (apparently invisible or with only weak distortion). Apparently allowed matter through on the surface (if it even existed there), but had to be turned off for ships and ion cannon fire going upward. Strong enough to withstand any Death Squadron bombardment. -15. DS2 Endor shield - remotely projected spherical shield, large dish projector, matter destroyed on impact, allowed outbound weapons fire, inbound laser fire results never tested. -16. Separatist Ground Shield - (forgot to add this earlier) - looks like Gungan shield, does not block matter (non-lethal) but does block inbound energy weapons and possibly some weaker outbound. From those, we could easily posit several different types of shield. "Localized Magnetic Field" - 2, 5 . . . not sure what else to call this group. Just weird. And no, I don't know what the rest of that sentence was supposed to be . . . it wasn't there. Not a bad top-of-the-head list, but in retrospect I see a few iffy parts. In any case, there might be enough to start building on here. One detail that sprung to mind recently, though, when watching the final season of The Clone Wars on Netflix is that a shield just like #6 was not lethal, so apparently there are still more variables to Star Wars shields than what is suggested above. Just a quick list . . . it occurred to me that we see ground-scale weapons used successfully against Star Wars ships an awful lot. According to some, of course, this ought not be even remotely possible. 1. Arguably, anytime a Vulture droid brings down an enemy ship of any kind is a ground weapon event, given that the Vulture is a walker as well . . . and, notably, one which we've seen hand weapons disable, albeit not destroy in the same flaming way as starfighter weapons tend to. 2. TESB . . . snowtroopers are setting up a blaster cannon for use against the Falcon, which is evidently of sufficient concern that it gets special attention from the Falcon. 3. "Revival"[TCW5] . . . a pirate uses a shoulder-mounted rocket launcher to bring down the small cargo ship Maul and Oppress are on by striking an engine nacelle strut, damaging it and the engine. 4. "Necessary Bond"[TCW5] . . . an older-model Jedi cruiser of about 100 meters length is shot down by a small hovertank. A single shot to one of the engines damages it and causes a number of secondary explosions on the ship before it crashes. The ship was being boarded for escape at the time, so the shields were almost certainly down. 5. "Necessary Bond"[TCW5] . . . Hondo, piloting a vessel that either is or is identical to Slave-I, withdraws from firing on a helpless and exposed General Grievous when two Separatist hovertanks show up. I think there are more examples . . . one could point out the Republic transports as seen in AotC getting knocked out of the sky at Ryloth, but those were (I think) anti-aircraft "proton cannons" and not any basic ground weapon like an artillery cannon. The only other time I know of those weapons being seen, they were at Geonosis (the second time) blowing apart Republic gunships. "Cadet 327: What reaction propels the main engines of this Jedi cruiser?" "Poles combine sparking off the reactor core rods, sir." "Post-combined sparking off the reactor core rods, sir." Turns out that I was repeatedly wrong, as were the subtitle guys. "Pulse combines sparking off the reactor core rods, sir." What we do know is that Star Wars engines are generally ion thrusters. The ANH script refers to X-Wings as having "ion rockets", and the TESB script refers to the Falcon's "ion engines". The TESB novelization refers to the ignition of the Falcon's ion engines, in reference to starting up the thrusters from a darkened state after the ship detached from the ISD. And, of course, the RotJ novelization explains that TIE fighters are Twin Ion Engine vehicles. Perhaps most importantly, given that all the other examples refer to very small vessels, the Revenge of the Sith novelization suggests that ion engines are the technological basis of even the bigger ship engines: "The shimmering canopy of ion trails and turbolaser bursts was fading into streaks of ships achieving jump as the Separatist strike force fled in full retreat." Whereas most rockets operate by burning or annihilating something in order to produce high-pressure gasses which are then directed out of a nozzle, producing thrust, ion engines operate by taking a charged propellant and, via electrostatic or electromagnetic fields, causing the propellant's rapid departure. The only alternate take on the quote that I can think of offhand is that the reactor core rods themselves are consumed, creating sparks of ionized gas that are then somehow combined and ejected. The reference to rods is somewhat perplexing, as well. Rods are used in fission reactor cores to control the reaction rate, commonly by being some material that will effectively consume the neutrons in the assorted fission reactions. One does not commonly think of control rods in most fusion setups. For fusion, one generally expects some sort of confinement . . . the sun's fusion is based on gravitational confinement, more or less, with fusion occurring because of the massive pressures in the core. Most of our attempts at artificial fusion are based on other confinement schemes, including magnetic confinement, inertial confinement, electrostatic confinement, or combinations thereof. However, there are fusion techniques involving assorted gizmos that might qualify. The fairly recent inertial-electrostatic confinement pyroelectric fusion system, for instance, features a tungsten needle. The basic idea is that pyroelectric crystals are used to generate an electrostatic field, with the tungsten needle being attached to improve the field strength. The field ionizes and accelerates deuterium, creating a deuterium ion beam aimed at a metal hydride (a solid with a lot of hydrogen in it, such as the lithium metal hydrides I've previously referenced on the site), with the goal being high velocity collision with the metal hydride, generating a fusion event with He-3 and a neutron as the product. As it stands now this technique is not very good insofar as it makes a ton of neutrons, but the same principle might be applicable with better technology schemes, and presumably could use a hydrocarbon as a target. There are also the fusor and polywell fusion devices, though neither involve rods as such. However, some of the cylindrical fusors could be thought of in the context of rods, somewhat liberally. The overall problem with all these notions is that the visible shape of most of the reactors we've seen in Star Wars doesn't really fit any approach. Sure, the Venator reactors look good for most purposes, but even those have issues. And certainly the hourglass-shaped reactors remain mysterious in any case. In any case, this quote neither helps nor hinders any particular point at the moment. This makes certain sci-fi shows with entirely too many habitable worlds in one system sound a lot less silly, however contrived the 60 Earth solar system configuration may be. And in any case, it brings "all your eggs in one basket" to an entirely new level. While it is tempting to imagine a species actively creating this setup by moving worlds, the simple fact is that if you can move dozens of planets to a single star, you really ought not need to. But boy, think of how compact the Federation could be if all the member worlds (with room to spare) got packed into a triplet of this configuration . . .